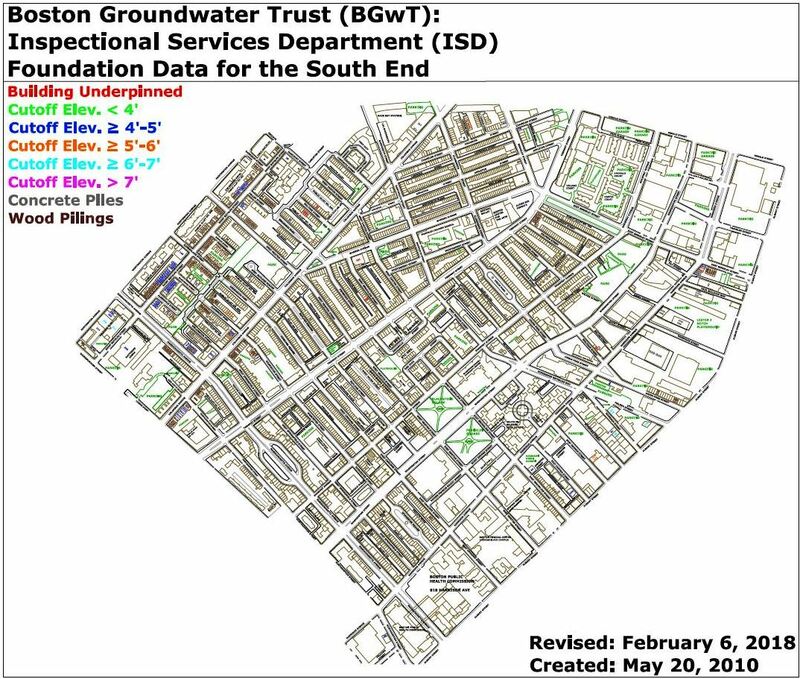 While the well data shows the groundwater level at a particular location, the important issue for wood pile preservation is the relationship between the groundwater level and the level of the tops of those wood piles. The level of the wood piles that support a house is sometimes called the "piling cut-off grade". When wood piles were originally driven, the tops usually ended up at different levels, so to set the granite block pile cap stones, the wood pile tops were all cut to the same level, thus the "cut-off grade". 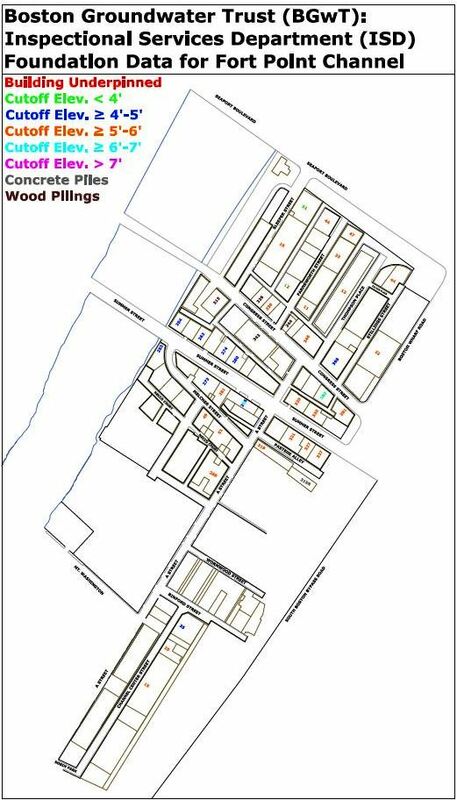 Wood pile cut-off elevations can vary substantially between neighboring buildings; sometimes there will be more than one cut-off elevation for wood piles within one building. In some instances a building may need to be underpinned. Underpinning is the process of stabilizing the building if the wood piles have rotted. Rotted piles are cut-off to a lower grade where the wood pile is stable and usually 2-3’ below the existing groundwater levels on site. 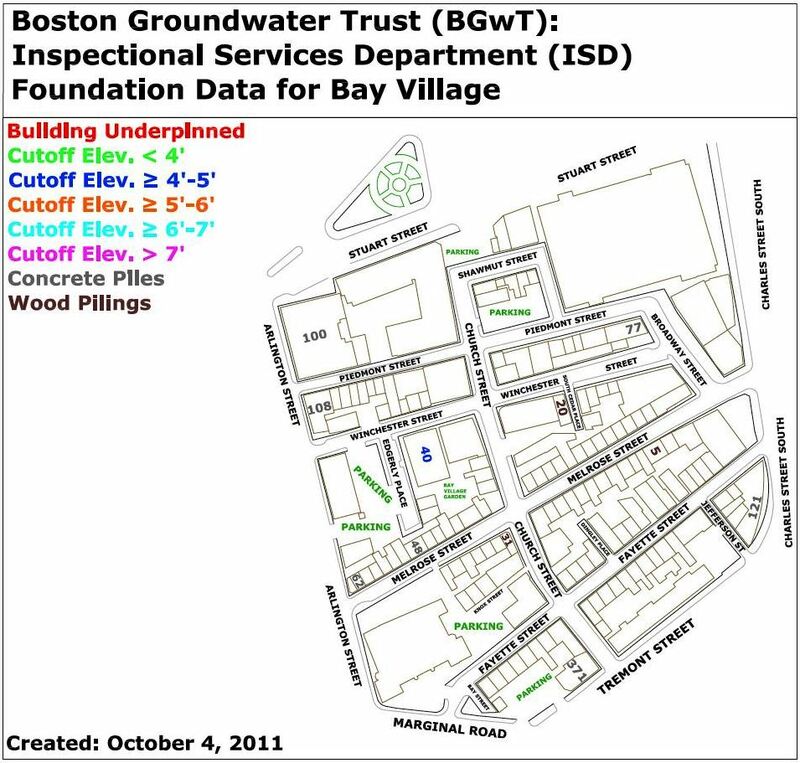 In continuing our efforts to obtain a better understanding of these different wood pile cut-off elevations the Boston Groundwater Trust (BGwT) has been reviewing individual building permit jackets at http://www.cityofboston.gov/isd/building/docroom/. Here the user can simply enter his/her street number, street name, ward, and select the appropriate document type from a drop down list. In regards to finding cut-off elevations and underpinning information, the BGwT reviews the Long and Short form building permits. The records include all of the building permits and zoning changes for the address. Unfortunately, they are not in chronological order. The Great Boston Fire of 1872 destroyed the majority of Boston’s commercial district. In that fire many official and private building documents were destroyed. Therefore no reports, plans, or permits exist in these ISD records from before 1873. 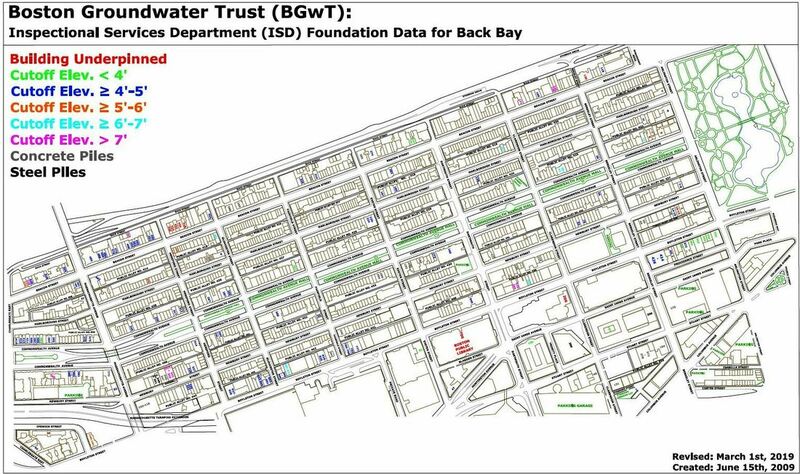 In researching the building permits, the BGwT records information that we feel might be helpful to someone who is looking for information about a particular building’s foundation. 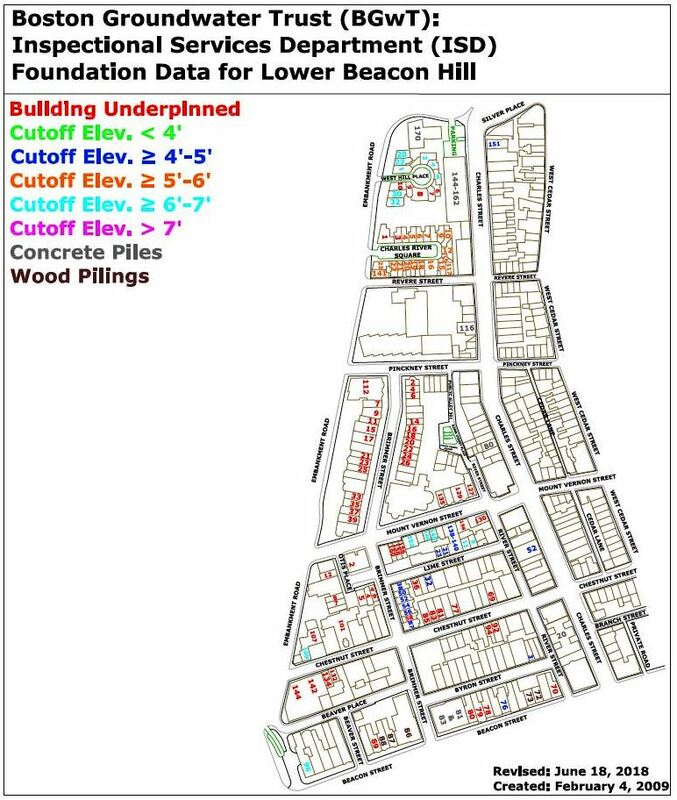 To view the areas that were researched and which buildings were found with wood pile cut-off elevation and underpinning information, please refer to the maps below. 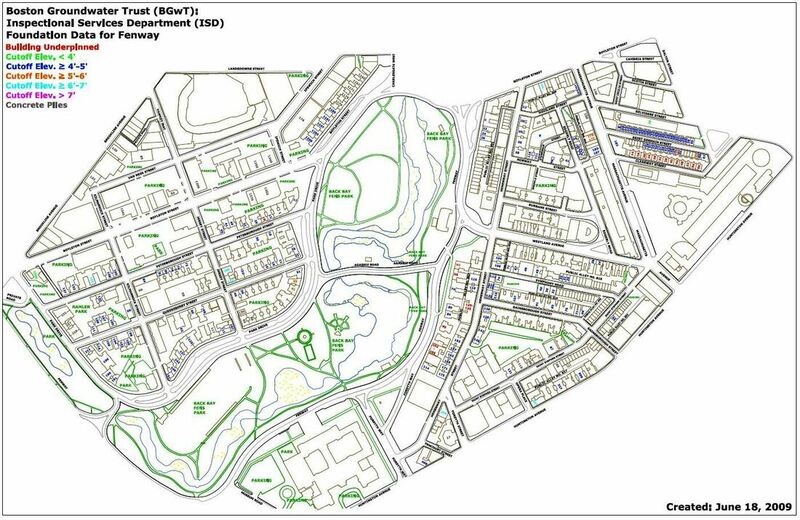 Additional maps of areas in the City will follow once the research in those areas is completed. When viewing the maps it is important to remember that the lower the cut-off elevation number, the better. 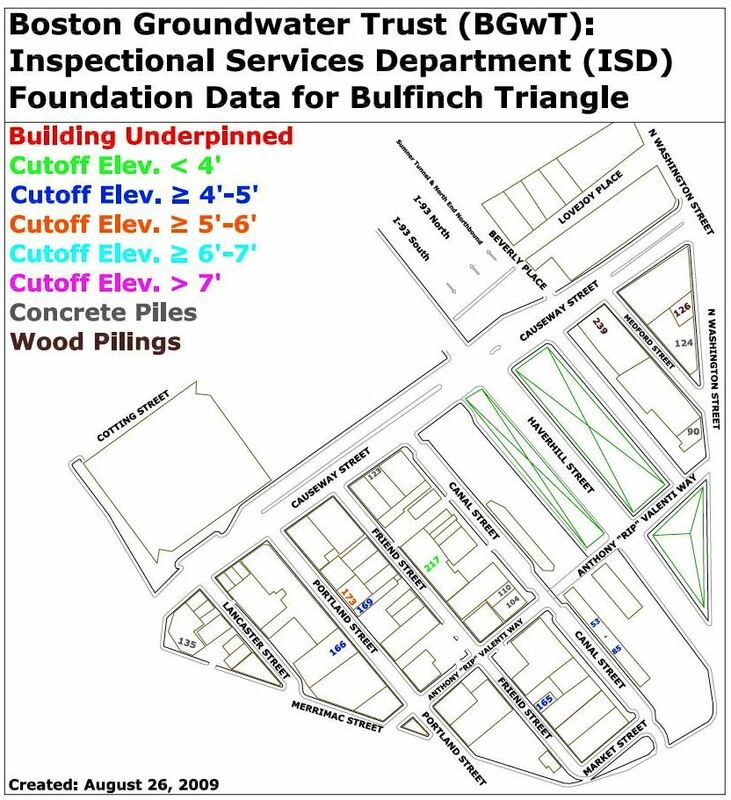 The information listed in the ISD Data files include the address, foundation type (wood, concrete, or steel), cut-off elevation, and whether or not the building has been underpinned. 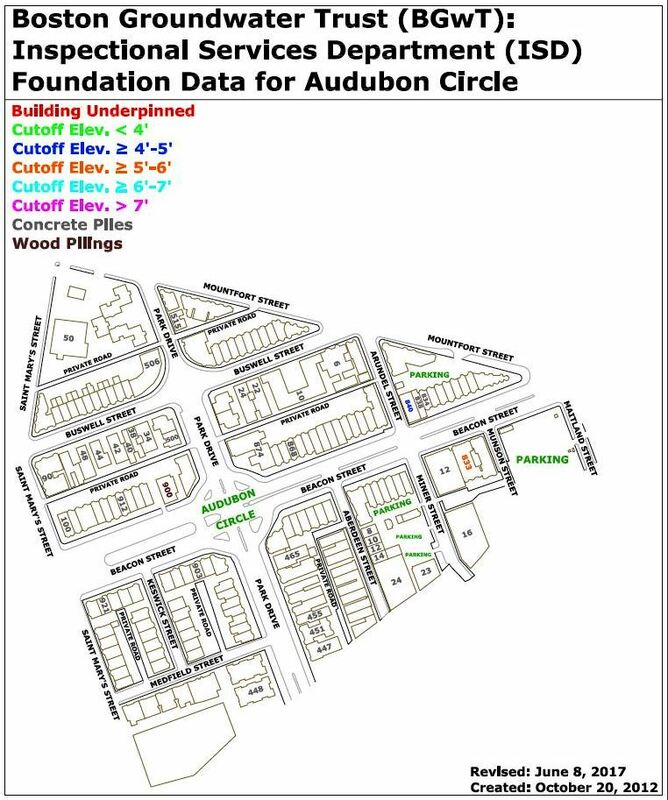 For a complete list of this information for a specific address please refer to the appropriate file link located under each map below. 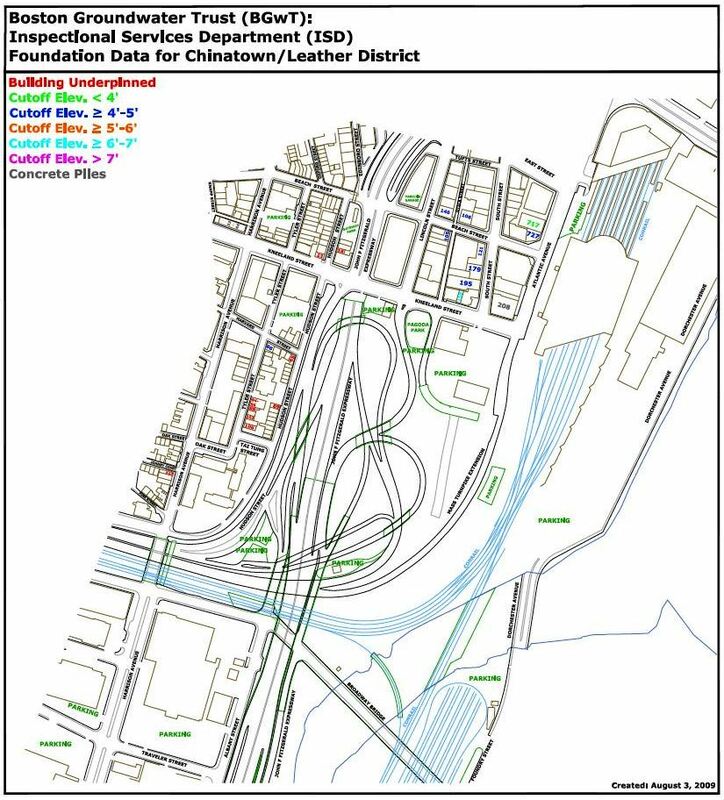 NOTE: Additional maps of areas in the City will follow once the research in those areas is completed.